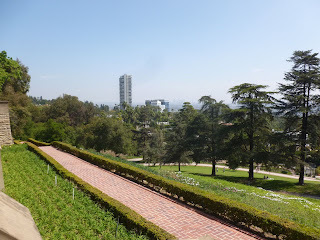 In March 2013, my family and I were in Los Angeles for a little three day get-away. 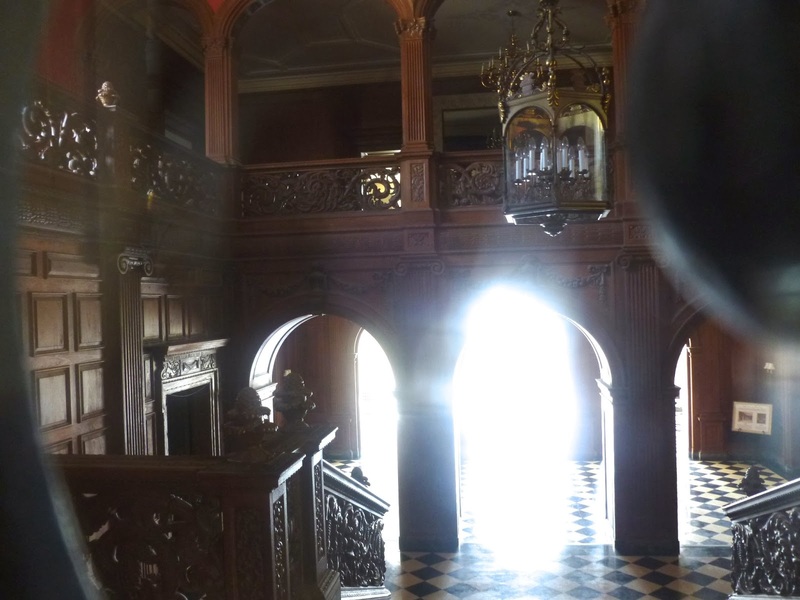 Here's a link to what we saw and did - most of which was free. 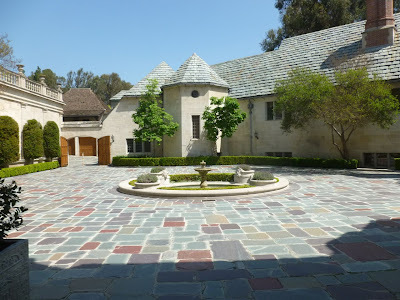 There were three "Hollywood" houses I wanted to see: the Brady Bunch House, the Spadena House, and the Greystone Mansion also located in Beverly Hills. Even though I grew up in Los Angeles, and then lived there five years with my wife and kids, I had never seen these three homes. 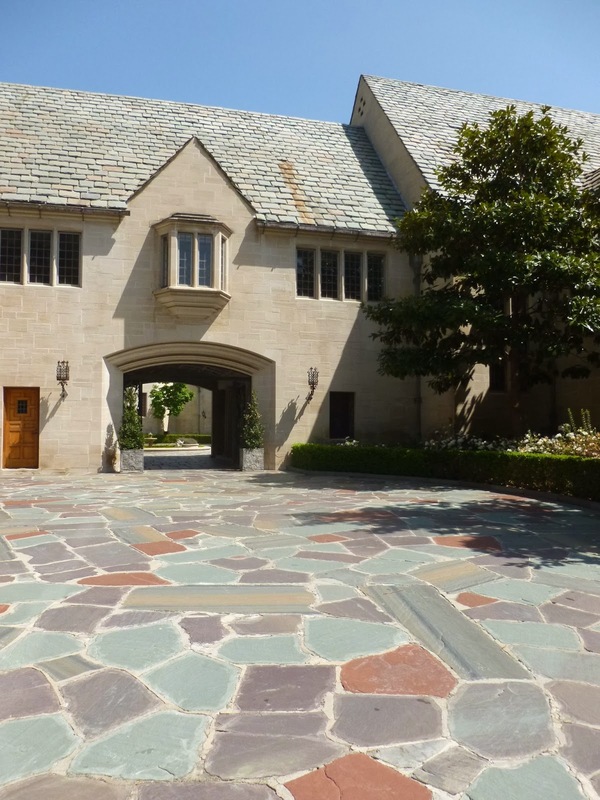 Left, the Greystone Mansion, located at 905 Loma Vista Dr in Beverly Hills. 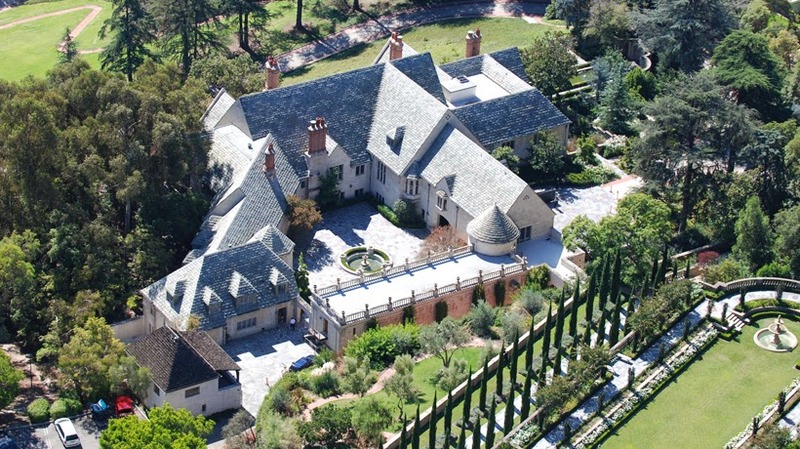 The mansion, also known at the Doheny Mansion, was completed in 1928, and was the former residence of Edward "Ned" Doheny, Jr., son of oil tycoon Edward L. Doheny. Walking in, my kids immediately recognized this home as the outdoor set for several old Mission Impossible episodes. Here's an impressive ariel shot - taken from another website - that gives a better idea of the size of this building and it's surrounding property. 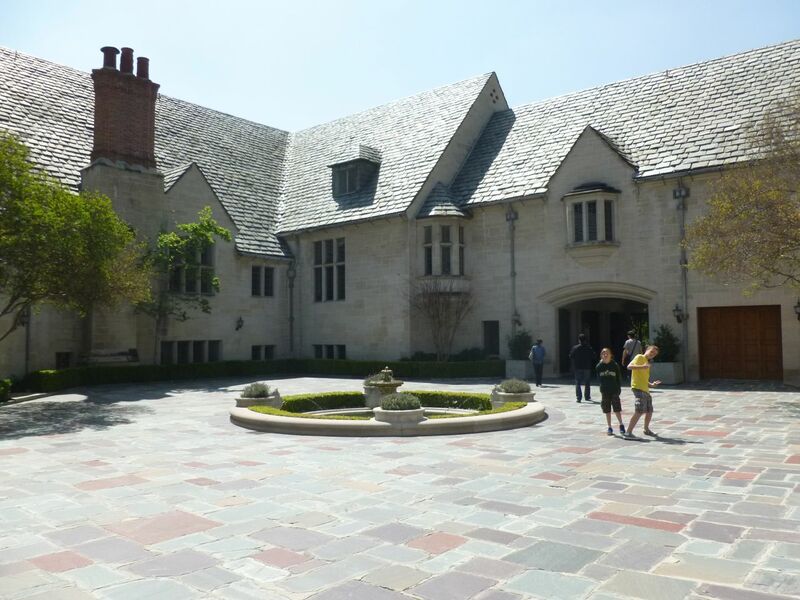 Over the years, the mansion has been featured in dozens of TV show and movies. In fact, while we were there, part of the estate was being used for yet another photo shoot. 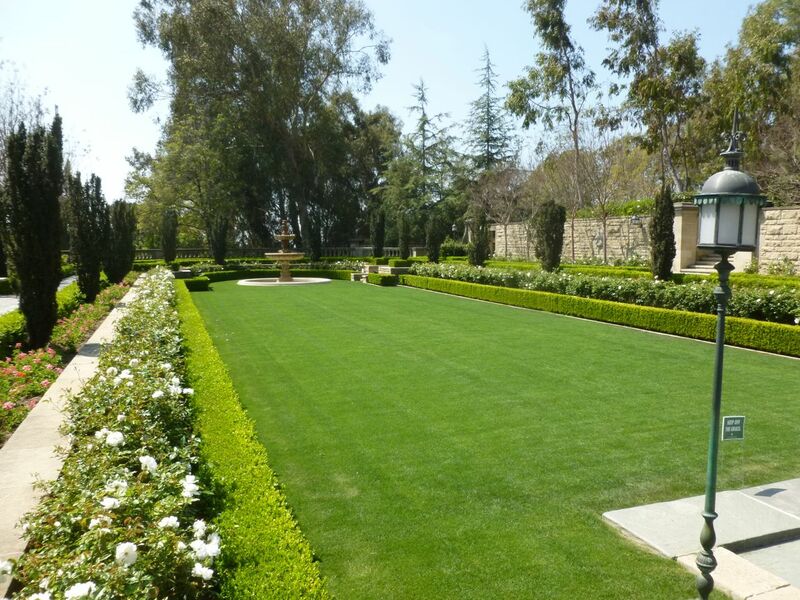 While the home is closed except for special events, the gardens and grounds are open to the public free of charge. Parking is also free. The estate was purchased by the City of Beverly Hills in 1965 as is technically a city park. If you've ever wanted to see a "Beverly Hills Mansion" up close, this is you're best bet. A view from the grounds looking east towards the city of West Hollywood. According the a wikipedia article, "on February 16, 1929, four months after Ned Doheny, his wife Lucy and their five children moved into Greystone, Ned died in his bedroom in a murder-suicide with his secretary, Hugh Plunket. The official story indicated Plunket murdered Ned either because of a "nervous disorder" or inflamed with anger over not receiving a raise." Massive house - yet a sad, tragic household. A final view looking east. 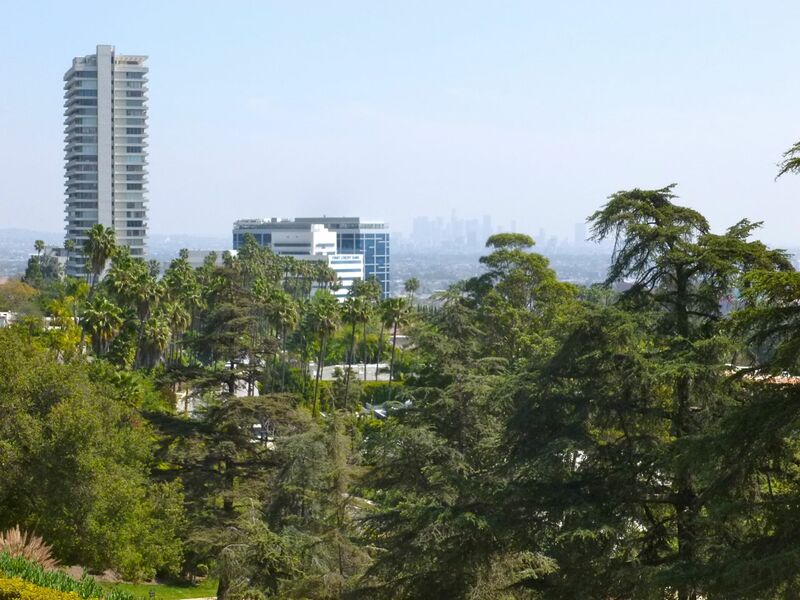 The tall buildings to the left are at the edge of West Hollywood. Barely visible in the distance are the office towers of downtown Los Angeles, located 10 miles due east. Here's a link to the Graystone Mansion's website. 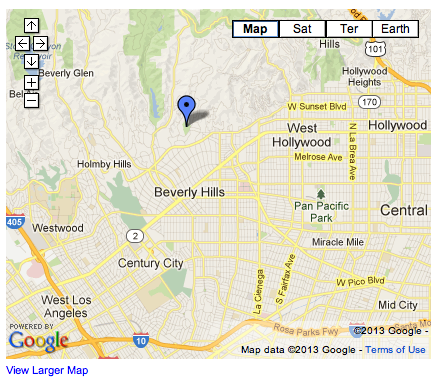 More on Original Farmer's Market, Beverly Hills, Holmby Park, and Diddy Riese in Westwood Village next week.